"Finding Neutrinos with (an) IceCube"
Super energetic neutrinos can be formed in exotic places, for example the accelerators in the core of galactic supermassive black holes. The IceCube neutrino detector array was built and deployed at the South Pole. The detectors are designed and positioned to find specific particles in a background of myriad charged particles bombarding the Earth. A particular event called IceCube-170922 was detected with an energy of 300 trillion electron volts and pointed back to a specific point in the sky. 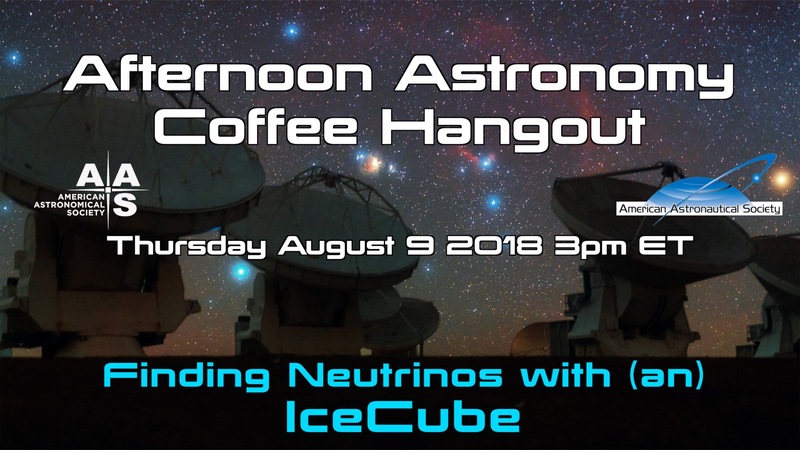 Join Tony Darnell and Carol Christian during Afternoon Astronomy Coffee on Thursday, 9 August at 3:00 pm Eastern Daylight Time (19:00 UTC) as they discuss with the investigators, including Erik Blaufussi (University of Maryland), how IceCube works, what the researchers hope to find, and the detection of IceCube-10922. During the hangout, you can take part in the live chat and join the conversation on Twitter with #AstroCoffee. An archive of previous hangouts in this series may be found in the Deep Astronomy YouTube playlist. What Are "Afternoon Astronomy Coffee" and "Future in Space" Hangouts? "Future In Space” and "Afternoon Astronomy Coffee" Hangouts are part of a weekly series, held every Thursday, that also includes a segment called "Footsteps to Mars." We bring the the latest research in astronomy, highlights from the future of space astronomy and astronautics planning, as well as updates on the exploration of Mars to you every week via Hangouts on Air. With the sponsorship of both the American Astronomical Society (AAS) and the American Astronautical Society (the other AAS), our hosts Tony Darnell, Carol Christian, Alberto Conti, and Harley Thronson examine today's breakthroughs in research and peer into the unfolding possibilities of what we may learn about the universe and Mars exploration. We join with members of the American Astronomical Society to chat, in an informal online setting modeled after "science coffee" events held in universities and research organizations across the country. We will examine what we hope to learn about exoplanets, black holes, the early universe, quasars, and life in the universe along with what technologies might help us — and reflect upon the scientific endeavors occurring today that uncover amazing astrophysics and lay the groundwork for studies to come. We will also explore the technology and engineering used today as well as possibilities for future space travel and research with members of both societies, and probe what our future in space may look like and how we might get there. We will examine the underlying technologies of space telescopes, orbiters, landers, and human space vehicles now and in the years to come. We will delve into topics that help us understand the possibilities and limitations of human space flight and eventual human colonization of other worlds. We hope you can join us each month as we bring experts from both societies — people who think about and plan for our future in space — to your computer, tablet, or smartphone. We invite you to bring your questions and comments and get ready to learn about the amazing possibilities for the future of space astronomy and exploration.